While others worship the Death Star, you bow to the Undead Star. Take advantage of your obsession with all things scary and really freak out your friends this Halloween (but also instill order in the universe). Just try this cool costume on for size…go on! We’re dead serious! 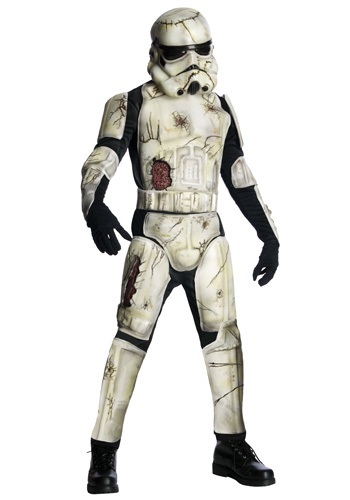 If your buds thought battling with an army of Stormtroopers would be bad, they’ll really rue the day you showed up at the party in this gory getup, ready to claw at their flesh and eat their brains (but also instill order in the universe). Dressed as they are as such lively Jedi knights, they’ve proven highly desirable targets, but remember your helmet limits your vision and your aim is bad, so you’d better grab a group of pals and clone yourselves in these Adult Deluxe Death Trooper Costumes. It will be clear within moments of walking through the door that that the Empire is having a bit of a zombie problem. Talk about evil overload. Not even a galaxy far, far away can protect this party from the serious scream-worthy night you’ll offer up in this outfit, which features a black jumpsuit and foam armor. The pristine white of Stormtroopers past has been replaced with dents, cracks, and bloody flesh, making for an even more menacing appearance. Last we checked, Stormtrooper helmets weren’t like those for bikes (that need replacing after their first impact), so slide into this damaged helmet and be prepared for battle. Just, you know, make sure there’s still order in the universe by the time your ride share arrives to take you home at the end of the night.